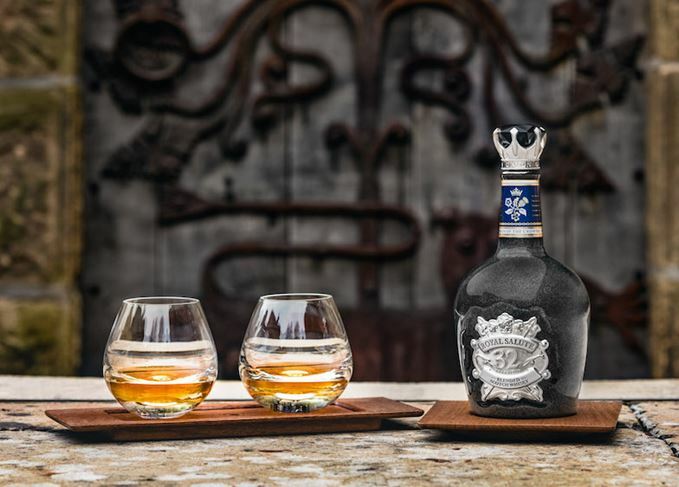 Luxury blended Scotch Royal Salute has unveiled a new 32-year-old expression to commemorate the creation of the modern British monarchy in 1603. Royal Salute 32 Year Old Union of the Crowns has been launched exclusively in travel retail to celebrate the moment when three kingdoms – Scotland, England and Ireland – were united under King James VI. Brand owner Chivas Brothers said the blend included liquid from distilleries including Longmorn, for its creamy texture, Glen Keith for its fruity character, Tormore for sweetness and Braeval for a richer flavour. Whiskies from closed distilleries Lochside and Caperdonich were also used. The new expression is packaged in a porcelain flagon embossed with a silver plaque, with a stopper featuring a black stone set on a silver crown. Each bottle is unique, thanks to variations in the patina of the glaze, while the neck of the flagon is decorated with a rose, a thistle and a shamrock. ‘The British Monarchy has been at the heart of the brand since its foundation in 1953 and, as a true representation of the exquisite craft of the Royal Salute blending team, we expect this new expression to become a sought-after collector’s item for international travellers,’ said Peter Moore, prestige brand director at Chivas Brothers. Royal Salute 32 Year Old Union of the Crowns is available in global travel retail from this month, with a recommended retail price of US$380 or local equivalent. Royal Salute has unveiled the Age Collection, a set of 10 blended Scotch whiskies, for US$40,000. The limited edition release is a collaboration with award-winning designer Afroditi Krassa.